Get a fresh pair of eyes to walk with you through the front yard all the way to the nooks and crannies of your home. Getting a friend or family member that doesn’t live there will give you a new perspective on what needs to go. Get your gardening gloves on and make sure your yard (the very first thing people see) is presented with viable plants and quality outdoor furniture. Take a moment to find the areas of your home that people will be using often. This could be your front hallways, doorways, landing spots for keys/purses/tv remotes, etc. Make these areas obvious by eliminating unnecessary appliances, shoes, toys, seasonal gear, hooks, and distracting piles of books/magazines. A select few items can be left out for accessorizing purposes, but keep it simple. Check out this For Sale By Owner article for more specific items to keep out of the way. Too much furniture can be overwhelming. Enlarge your rooms by ditching excessive chairs, side tables, and lamps. Then, arrange the room so that the focal point leads your eye to your best piece of furniture, allowing buyers to see the potential of each room. (Rob Morelli agrees). Living rooms are typically a central gathering point of a home, so it is crucial that you remove anything that could hinder the display of its full potential. As Ideal Home put it, “Tame the Technology”. Game consoles, messy wires, DVD players, multiple remotes, and WiFi routers need to be organized or removed. Consider a cable sleeve to keep your cords aesthetically pleasing and nonhazardous. Tame a room by removing excess personal photos and knick-knacks. You do not want potential buyers lingering over collectables or being curious about your family. Rule of thumb: remove anything smaller than a bowling ball. In staging terms, little items can be considered "room dandruff". Opt instead for larger, bolder, or simpler items and settings. If you have a cluttered bookshelf, a good way to master it is to take off everything and only put back what you need or want to look at. This For Sale By Owner article gave us a few ideas on what to do with your kitchen full of appliances. Count every inch of counter space! Unused dishware, holiday plates you never bring out, and scattered utensils should be stored away. You could even install large appliances such as a microwave into a lower shelf. This gives you more clean counter space to work with. Efficiently store your pots and pans with a pan rack for organized, neat cabinets. Go ahead and get rid of the smaller appliances. This includes unused pans, tools, Crockpots, baking equipment, etc. 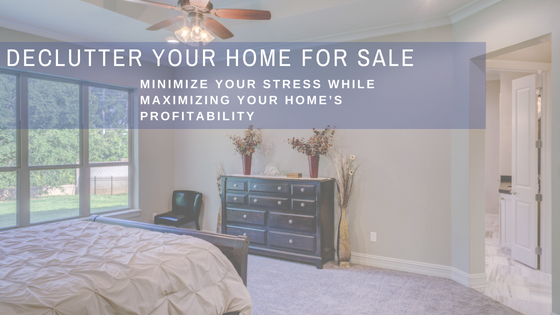 However, it is important to strategically leave a FEW items that buyers can use as inspiration. Sponges, cleansers, dish towels, and cleaning supplies should be kept minimal and under the sink. Allocate some time and attention to your fridge and pantry. If you even question a food product, throw it out! The six month rule is handy here. Any evidence of unwanted pests (such as ant powder) should be gone! Thoroughly clean your bathrooms! Switch your mentality to “host-mode” by always being prepared to have guests. This will make you aware of your unneeded bathroom junk. Makeup, shower essentials, old linens, rugs, and piled up beauty products inside your cabinets need to GO. 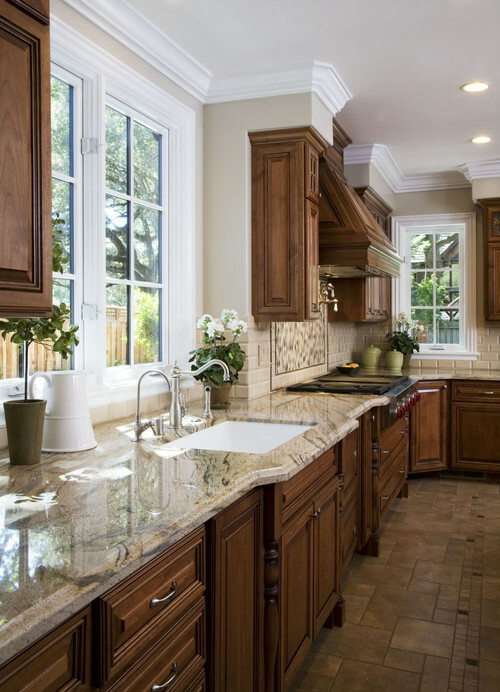 Buyers will look into the cabinets, so be sure to give them a clean slate. Temporarily relocate any medications, jewelry, and unused toiletries. This will allow potential buyers to imagine their own products and personal items in the space - keep this in mind for each area of your home! Have a storage tub ready to put in the extra toiletries for quick storage when the home is being shown, or even if you are having guests over. This can work for kitchens as storage for spices and common cooking tools. Look through this Stage My Own Home article for more tips on dealing with linens, old beauty products, rugs, dirty shower doors, leaking toilets, mildew, and more! Now, where do you put all the junk you have cleared out of your home? A few more things to consider before starting this seemingly daunting process: think of yourself as staying at a hotel for a short period of time. What do you truly need and actually use? Lastly, think positive. Your house WILL sell...you might as well start packing up those extra items now.